This material comes from a weekend program offered at BCBS in January that was specially intended for psychotherapists. The program consisted of continuous, silent practice of insight meditation, from Friday evening to Sunday morning, and then concluded with an open discussion. The program was meant as a gathering of peers and was led by Trudy Goodman and Chris Germer, both members of the Institute for Meditation and Psychotherapy. There are a number of different approaches we might take to mindfulness practice in psychotherapy, and these can be arranged along a con­tinuum of increasing practical applica­tion to the life of the client. The first approach is the meditating therapist; that’s all of us. We may take our experience and insight into the therapy room and apply it in various levels of engagement. The next stage along the con­tinuum might be mindfulness-informed psychotherapy. Much of what has been written on the subject falls into this general category. Mark Epstein’s book Thoughts Without a Thinker is one example. Another good new book by Barry Magid is called Ordinary Mind. And Anthony Molino wrote The Couch and the Tree, an edited collection of essays on the interface of meditation and psychotherapy. John Welwood also wrote many books, including Toward the Psychology of Awakening. Moving on, we come to mindfulness-based psychotherapy, which actually has technical interventions based on meditation techniques and understanding. There is Marsha Linehan’s Dialectical Behavior Therapy, of course; and we might include a book by Jeffrey Schwartz called Brainlock. I found this book deceptively great. At first it may seem like a self-help book, but as you internalize his principles for treating obsessive-compulsive disorder, it’s remarkably helpful. Tara Bennett-Goleman recently came out with Emotional Alchemy, and she did some nice things in that book. For example, she emphasizes emotions in the whole cognitive therapy world, and follows the work of her supervisor Jeffrey Young, who wrote about schemas or core beliefs. She brings mindfulness to core beliefs, which is like taking a lightning bolt and breaking up a whole mountain. It’s a powerful technology, and is worth reading. One of the more helpful books for bringing mindfulness into the psycho­therapy world is Zindel Segal’s book, Mindfulness-based Cognitive Therapy for Depression. He and his colleagues worked with Jon Kabat-Zinn, and also had lots of experience working with depression. They created an eight-week treatment program for depression, following the meditation techniques used in the Mindfulness Based Stress Reduction program. The book describes the treatment in detail and their evalua­tion research. Their placebo group was made up of patients who were in ongoing therapy, while the treatment group consisted of people who also took the mindfulness-based cognitive therapy program. Five years afterwards, relapse rates for people in the treatment group were almost half that of patients in the control group. Sixty-six percent of the people who did not take the mindful­ness group had a depression relapse within five years, compared with only thirty-seven percent of those who had practiced meditation. That’s remarkable. Also interesting is the fact that those who benefited most from the program were people who had recurrent episodes of depression. The people who had only one or two episodes prior to treatment did not benefit more than the placebo group from their specialized mindfulness treatment. Why do you think that would be? One hypothesis is that people who have recurrent depression ruminate—there is a lot of internal talking. Mindful­ness practice goes deeply into the mind and exposes that conversation, allowing us to re-evaluate it and to respond rather than react to it. The researchers surmised that people who only had one or two episodes probably had a reactive or situational depression, whereas those who had more episodes had developed a ruminative condition or style which made them vulnerable to depression again and again. The mindfulness practice seemed to change that significantly, which is also remarkable. So this sort of treatment would be an example of mindfulness-based psycho­therapy. Perhaps the most practical applica­tion for clients of mindfulness in psycho­therapy might be the meditating client. This is rare, of course, and it is important to note that meditation is not for everyone. There are many cases when meditation would not be recommended, and might even be harmful. But when one is able to work with a client at the level of awareness offered by meditation practice, some wonderful transformations can occur. Participant: I’m quite new to Buddhism; I’ve read something about it, but still have a lot to learn. At first I thought it was all this warm, fuzzy stuff. Then I realized it’s much more wonderful than that, but even so it’s not often warm and fuzzy. Can you say a little more about what mindfulness practice is bringing to the enterprise of psychotherapy? Chris: The core notion of the mindful­ness model, at least as it is evolving at the Institute for Meditation and Psychotherapy and at the hands of other colleagues, is to first facilitate awareness and acceptance and, secondarily, change. In meditation practice we are continually paying attention, and ideally we are doing so without judgment and with an accepting heart. But we so often get swept up in our dramas or stories, which can be seen as merely the product of conditioning. Suffering begins as soon as we get entangled—that’s a key word for this model—in our condition­ing. If it’s a good story, we enjoy it and we suffer when we get dropped. If it’s a bad story, we get dragged along and are very unhappy. But as long as we’re entangled in the conditioned drama, we are participating in a process of suffering. Let’s look for a moment at a model worked out by one of our founding col­leagues, Phil Aranow. He describes two basic conditions of mind. The one we are usually in, the conditioned mind, is composed of automatic thought patterns which are mostly unconscious and quite repetitive. It includes a lot of regret about the past and anxiety about the future. Attention hops like a monkey from one subject to another as we try to hang on to things that feel good and avoid things that feel bad. Then in meditation, and at other times in our lives, we may have mo­ments of being aware of the condition­ing. These are moments of insight, in which we may notice that we have been carried away on some conditioned train of thought. In meditation jargon we say that the mind has wandered from the primary object of awareness, say the breath, and we gently, without judg­ment, bring it back. That is a moment of insight—modest, but important. Such moments of awareness require a great deal of conscious presence, and are thus not merely the product of unconscious conditioning. In such present-focused moments, the mind is responding rather than reacting to presenting phenomena. Meditation involves going through this cycle again and again. We are entangled in our thoughts, we notice it and pop out, and then we get pulled back into the stories. Then we pop out again, get pulled back, over and over. This same sort of process occurs in psychotherapy. Our patients are entangled in their conditioned thinking. They’re coming to us in order to get disentangled. Now the key is: Are we going to get entangled in their stories and then be unable to help—because we’re both caught? By cultivating our own mindfulness practice, and by not running away from the experiences engendered in us, we can be aware of the entanglement and help disentangle it through any number of interventions. Chris: Sure. Jon Kabat-Zinn has written very nicely about that in his book Full Catastrophe Living. When we are awake to our conditioning, then we can choose, “Do I want to do this, or do I want to do that?” When we are not, we are just linked inexorably to go down the same mind-road we did yesterday. There is another book I would recommend on this subject, called The Heart of Addiction by Lance Dodes. It is not billed as such, but I consider it a mindfulness-based book on addiction. He says that addiction starts the moment you think about, for example, alcohol, and you start to feel better. The anxiety decreases. When you have a bad day at work and you think, “Ah, I can have a drink on the way home,” the anxiety subsides. If at that moment you have the mindfulness to enter that place and say, “Oh, well, I could drink, but I could also take a bike ride, or I could also go to the movies…” In other words, when we can introduce at that early stage of deci­sion-making a diversity of options for reducing anxiety—that’s how we begin to break the addiction. This is an example of responding rather than reacting. Most people here have been meditating a while or thinking along these lines. Perhaps some of you can say more about ways or instances in which you might be integrating medita­tion and psychotherapy in your own professional work. Participant: What you seem to be describing here sounds to me like doing good psychotherapy. You’re framing this in terms of bringing mindfulness to the work, but it’s really about joining with the client. Starting with where the client is, the therapist needs to be able to reflect back what she or he is seeing in a way that is digestible by the client. It seems you are also saying the mindfulness helps with tolerance, with being able to sit deeply with a client rather than warding off. Chris: I think in any school of psychology we can aspire to do good therapy. If we are practicing mindful­ness, then when we go into the therapy room we may draw upon the practice to guide or help us see certain things. The non-avoidance of suffering you mentioned is one of these; another is a greater precision of moment-to-moment awareness. Participant: It seems Buddhism has a precise vocabulary useful for its own purposes, but I have found it is not always easy using these words in more traditional psychotherapeutic settings. People are scared off by it, or just don’t get it. I do mostly psychoanalytic therapy, and work with a lot of teenag­ers. Even when I use a word like “suffering” in a Buddhist sense, they often don’t pick up on it. Chris: I know what you mean. I once used the language of mindfulness and a patient said, “I’m not going to become a Buddhist!” What he was actually saying was, “I want you to pay attention to me, okay? Not just run your shtick by me.” That was a wake-up call. Participant: One issue I had struggled with, and received a lot of help from the meditation practice, has to do perhaps with the Buddhist notion of non-self. I work with couples, and I found I was really fearful about con­fronting emotional abuse when it was coming at me, especially from the male partner. It’s because of my own dynam­ics, I know. As I worked that through, I found it helped a lot for me to think of myself simply as a mirror—that ubiqui­tous Buddhist image. When truly mirroring what is unfolding, rather than just playing out your own dynamics, then there is a truth manifesting that eventually has to be absorbed. It turned out the other therapists were not calling him on it, and were sort of dancing around the issue with suggestions of “I-reflective” communication and so forth. This just allowed the couple to blame the therapist for being inept and to continue in their unhealthy dynamic. When I was able to confront what was happening there, things got a lot better very quickly. But I really had to work at taking myself and my own conditioning out of the situation and focusing on the simple mirroring of what I saw happening. Participant: I agree about the importance of not necessarily trying to change what’s going on with a client but rather of observing it carefully and truthfully. Then—something will shift. It is so much like the meditation practice, isn’t it? Chris: You describe a process very much like what Zindel Segal and his co-­authors talk about in their book Mindfulness-based Cognitive Therapy for Depression, when they discuss developing a de-centered relationship. It’s a matter of no longer being centered in our story about things, but becoming de-centered from it so we can witness our story instead. Witness the depres­sive ruminations that cause relapse, witness the blocks to our initiative to go forward, and then re-author the script. Participant: But I am most inter­ested in what this practice of mindful­ness adds to that perspective. Therapy does those things very nicely, but there are two things I’ve found mindfulness adds. The first thing it adds is a non­verbal way of experiencing emotions and reality—psychotherapists are so verbal and intellectual. The second thing is compassion, which I don’t think Freud talked a whole lot about. Chris: I think he had compassion, but he didn’t talk about it. It was unscientific. What meditation has done for me is help me find in my responses and reactions the places where I do have a similar experience. I have at least touched some of those experiences, and can relate to the fear about “Who will take care of me as a single woman as I go through all this?” Meditation has been very helpful to me as I explore this common ground, which can only come from standing back from my story line. As I remove the details of my own conditioning, I find myself more capable of opening up to a more universal human experience. Participant: Something I use a lot in my professional work is noticing. I ask some of my clients to just keep track of things, perhaps only a few times a week, and notice what has happened. I suspect this is a form of mindfulness. Sometimes when you notice what is going on when you’re drinking, for example, the noticing of it brings some information that can be useful. Both the therapist and the client may notice patterns of behavior or motivation that were otherwise unobserved. There was also a time about ten years ago when I worked with elemen­tary school children. The Ninja Turtles were big, and apparently they do meditation as part of their martial arts. So I used that to talk about a skill rooted in concentration that caused them to be powerful. “You too could practice that,” I would say. I’d encour­age them to try to pay attention to their breath, to see if they could do it ten times, maybe a couple of times a day. It’s hard to judge the effects of that, but the overall therapy ultimately worked and it felt good to stop and breathe. Participant: I’m involved with a foundation [www.innerkidz.coml that is involved in bringing mindfulness into the schools. I’ve taught kids dependent origination just with eating an apple. It’s somewhat like creating a breathing space. They absolutely take to it, and they love it. We were taught by one of my teachers, Jean Piaget, that children were not capable of this. It’s not true! They are really capable—not of sitting for hours in stillness, but that’s not what they’re doing. I would recommend a book on the subject by Zimmer called Teaching Meditation to Children. Participant: I too have worked primarily with adolescents, using Jon Kabat-Zinn’s program. I also worked with patients who had eating disorders, using the body scan. It was really helpful for them just having a felt sense of their bodies. It was different from what their minds were telling them. I have worked with some people who were so totally lost in their stories I felt they really needed some kind of mindfulness training to be able to have some success in therapy. Depending on the person, either it was helpful or they just couldn’t handle it. Chris: Some clients take to meditation and some don’t. There has been a lot of research on this, and I have actually reviewed much of it. One interesting fact I have learned has to do with which people continue to practice and which do not. What do you think? Will patients or non-patients be more likely to be meditating two or three years after they have learned it? It’s actually patients, and to a significantly greater degree. Back in the 80’s, Delmonte and Jon Kabat-Zinn independently collected data on meditation drop-out rates. Loosely combining their findings…after three months, 36% of non-patients had quit meditating. After 18 months, 72% had quit meditating. However, amongst patients, only 5% quit after three months, and after 36 months 58% quit. So we can have some courage about sharing a practice which we know from personal experience to be beneficial. People come to see us and they’ve got distress. The data suggests that our patients are more likely to continue with mediation practice. I would also like to suggest two factors which correlate with positive psychotherapy outcome that may be the same for medita­tion. One factor is distress and the other is rapport. If somebody just learns meditation because they think, “Oh, that would be fun to do on a Friday night,” they’re less likely to continue. But if there is substantial distress and an ongoing rapport with a teacher or fellow meditators, I think the likelihood that a person will continue meditation and benefit from it is great. One question we might ask is “What kind of person takes to medita­tion?” What we’ve found, amongst other things, is that people who are what Delmonte calls “repressed/ extraverted types” are more likely to continue. “Repressed” means they “are able to repress what comes up in meditation when they leave the cush­ion.” “Extraverted” means they can “engage in an extraverted way.” People who quit may include those who, if they get retraumatized in meditation, can’t forget it when they walk out the door. Walsh showed in studies with Transcendental Meditation that people who continue in meditation are interested in internal experience and open to unusual experience (I suppose this is intuitively obvious). Also, people who feel they have strong self-control, are less emotionally labile, and who acknowledge personal flaws are more likely to continue. Participant: What you seem to be describing as a person well suited for meditation is a person with good ego strength. Chris: That’s correct. One of the challenges teachers need to pay attention to is whether, when meditation gets difficult, a person is experiencing ego fragmentation or is merely passing through a negative mind-state. It’s a key distinction, and you really have to know the person in order to answer that question. If a person keeps pressing on as the ego is disintegrating, it can be very dangerous. And if a person quits just because they have some negative mind-state, but they’ve got a good foundation, they miss a breakthrough. Perhaps you are familiar with how Jack Engler put it many years ago: “You have to be somebody before you can be nobody.” He has actually backed away from that model in recent years, in part because it is quite linear. We are now more comfortable with a non-linear model, where we can develop attentional stability and can develop a sense of self as we pass through negative mind-states. In other words, we can in a way do both, which opens the field somewhat to the types of people we can help with mindfulness practice. 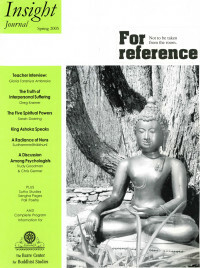 In fact there are many clinical indications for meditation as an autonomic, self-regulation technique. Meditation for stress management can be written with impunity on managed care forms; managed care likes it! There is a long list of empirically-validated clinical indications for meditation: anxiety, panic, ruminative depression, insomnia, pain, infertility, asthma, migraine headaches, diabetes, hyperten­sion, substance abuse, anger management…The National Institute of Health, back in 1988, sent a memorandum to insurance companies around the country saying they should reimburse the teaching of meditation for insomnia and pain. Participant: Is it appropriate to teach our clients meditation ourselves, or should we send them to someone else for that? Chris: You just have to pay attention to the transference. You don’t want to ruin the therapy or ruin the meditation because of transference issues. For example, if the meditation has problems and the client is trying to be a “good client,” then the difficulties may not be reported and the meditation experience will suffer. Conversely, if the client is mad at the therapist for some reason, she or he may quit practicing mediation in defiance. Generally speaking, I like people to learn medita­tion outside, because then they have a holding environment where they can continue meditating long after therapy is over. Participant: There is a hospital affiliated with my practice that has a wellness program, and they offer evening courses in all kinds of medita­tion. So I just direct people there. Such resources are becoming much more accessible in mainstream circles.